If you enjoy coloring your hair on the regular and also love using those superhot styling tools, listen up. These things do not go well together. This is especially true for people who experiment with fun, crazy colors (especially the metallic-looking ones). Ever notice those awesome hues start to fade more quickly when you’re always flat-ironing or curling them? Well, there’s a reason for that — hair dye is heat sensitive, and too much exposure to hot temperatures means bye-bye, color. 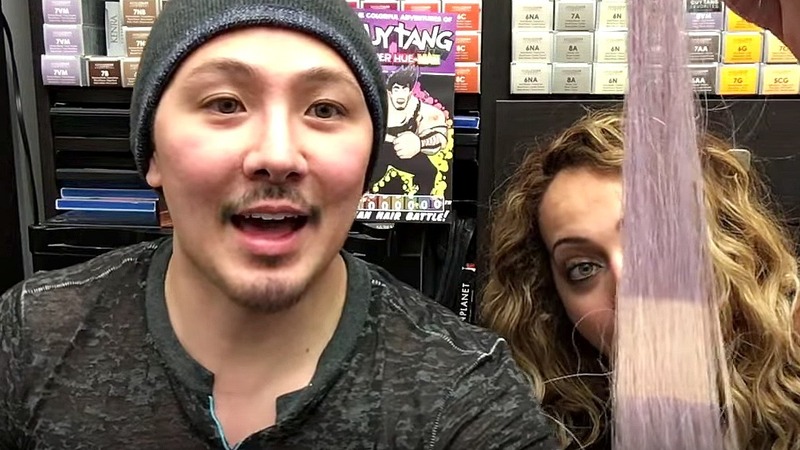 Below you’ll see expert hair colorist Guy Tang demonstrate just how quickly a hot flat iron (400 degrees F) can zap your newly dyed hair of its gorgeous color. Man, can you believe how quickly that metallic purple color faded? As someone who has been dyeing their hair red since middle school and using various hot tools regularly, this video was pretty terrifying to me. Professional hair coloring is not a cheap process, and now that I see just how much I might be contributing to my own fade-out, you can bet your boots I’ll be leaving my hair alone a lot more often. However, flat irons and curlers are far from the only thing causing hair color to fade faster. Here are some more things you’ve probably done that are likely doing some major color damage. If you color your hair, you definitely want to stay away from shampoos that contain sulfates. Sulfates are detergents that strip the color molecules from your locks. Fortunately there are plenty of sulfate-free shampoos on the market now, and they’re usually prominently displayed as such. If you love a superhot shower, you might want to consider changing your ways if you also love your hair color. Hot water lifts the outer hair cuticle layer, which has a lot of your original color in it. Try sticking to warm or even cool water, if you can stand it. The sun’s harsh rays are not just bad for your skin; they’re bad for your hair color too. The UV rays break down the color particles, which lightens the hue considerably. To prevent this, wear a hat as much as possible when you know you’re going to be in the sun. There are even leave-in conditioners with UV-blocking components that can help protect your color too. The chlorine in pool water can build up over time and make your hair color look dull. If you’re favorite pastime is pool time, try washing your hair with club soda after you’re done for the day. The bubbles help cleanse your hair of the chemical buildup. If you dye your hair regularly, you know it’s always a more intense color on that first day. Many women head right for the shower to bring down the hue a bit. Resist the temptation! Showering too soon (and too regularly) strips the color down so much faster. The color needs at least 24 hours to really set in your hair. Wash it before then, and you may find yourself in your colorist’s chair a lot sooner than you planned.